There is nothing better than starting the day with the right kind of foods. This Easy Breezy Super Healthy Breakfast Egg Muffins recipe is the perfect morning meal for you and your family. Kids and adults will enjoy these little muffins that are full of nutrition. The best party about this recipe is that you can use different ingredients for your muffins all the time. I use whatever I have left in my fridge which is very convenient. Veggies, cheese, deli meats, etc. Just make them according to your taste. This couldn’t be a better way to make an easy breakfast that everyone in the family will love. If you are interested in more easy to make and delicious healthy breakfast recipes, please see 5 Of The Worst Breakfast Foods For Kids Plus DIY Healthier Options You will find information about the importance of having good breakfast options available, and learn what are the worst processed breakfast foods in the market. You will also discover more healthy breakfast recipes to help your family start the day with the right morning meals. Remember that homemade food is always the best choice! You can also try some of my favorite morning recipes like my Sweet Potato pancakes or my Blueberry Kale smoothie recipe. They are super easy to make and my family loves them. This recipe is really full of nutrition. I like to use organic pasture raised healthy eggs that will give you lots of high quality protein. Some veggies will add fiber, vitamins, minerals, and other important nutrients to this super healthy and easy breezy breakfast option. These little muffin cups are also so easy to make, you can get your kids involved in the process. My kids get super excited every time I make them. 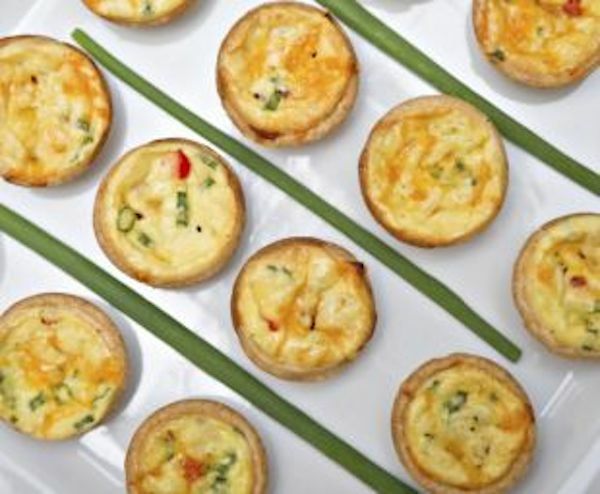 Instead of boring scrambled eggs, give them super fun egg muffins. They love adding the different toppings and watching how they bake in the oven. Not only is this a healthy recipe, but a fun activity with the little ones. Check out my 7 Healthy Breakfast Ideas For Busy Families. Find super easy to make breakfast recipes you can make in just a few minutes. Morning routines can be really stressful for families, so get ready with easy breezy ideas for your family. They also make great brunch recipes for a small weekend party with friends and family. All you really need is a muffin or cupcake tin, eggs, milk, and your favorite ingredients. You can add different toppings for more variety, and according to the different tastes in the family. This is a great recipe also if you want your kids to try new foods. The veggies are kind of hidden in the muffins, making it easier for picky eaters to want to eat them. If you don’t eat them all for breakfast you can save some for later. You can even pop a few in a lunchbox or take them on-the-go for a healthy snack. I really like these egg muffins with ham and cheese, or spinach and bacon. Mushrooms and cheese is another family favorite combination. Try also red or green peppers, tomatoes, zucchini and even some quinoa for extra protein. Make a big batch with different toppings and have them ready for the week. This way, you could have different flavors each time. There are so many options to choose from and you can use whatever you have available in your fridge. Leftover veggies from dinner? Shredded cheese sitting in your refrigerator about to expire? What about some deli meats you have left from making some sandwiches? 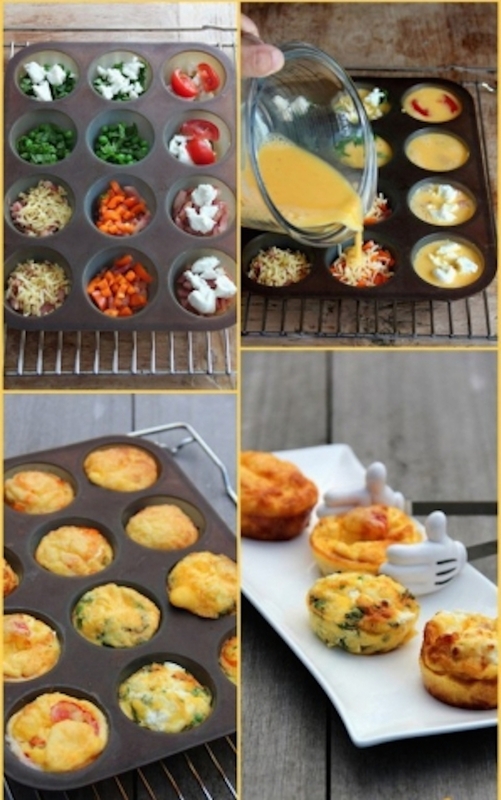 Don’t waste any food and make delicious egg muffins! Isn’t it just great? I think so! An easy breakfast option for all. This recipe saves you time and money, and your family will absolutely love these easy breezy, super healthy and delicious breakfast egg muffins. You can keep them in the refrigerator for about 4-5 days. What I do is pop them in my toaster oven 5-7 minutes before serving. They also freeze well. Kids love muffins so they will be more willing to try new foods if they are presented in a creative way. Try adding a veggie and see if they like it. You can start with mild flavors like spinach, cauliflower or carrots. Then, little by little add more ingredients, try using different toppings each time, and watch your kids fall in love with this recipe! Yum! For adults, this recipe is like eating your favorite omelette in the shape of a muffin. If you are looking for more recipes, please see my 3 Healthy Breakfast Ideas For Eating On The Go and Best Breakfast Baked Avocado Eggs Recipe posts. Most of my recipes are really easy to make. I believe in cooking with fresh and good quality ingredients. 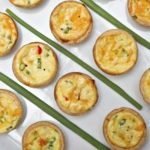 Really hope you enjoy this egg muffins recipe, and please let me know if you have any questions, comments, or suggestions. I would love to know that other families are enjoying them as much as we do. If you are interested in reading more about my blog, please take a look at my latest articles. I am a mom blogger who loves to share creative and healthy fun ideas for families. Got this idea originally from Herfamily blog. I also believe kids deserve to eat real food. They deserve food cooked at home, and made from scratch. With just a few fresh ingredients, I believe we can make delicious meals that our whole family can enjoy. Can you use egg whites? I just made these with eggwhites. They turned out great! Sounds like a good idea. These would freeze okay? How long do you think these would last in the fridge? I think these would be great for meal prep, but I’m not sure how often I would need to make a batch. Hi, I would keep them in the fridge for 3-4 days max. So you don’t have to cook the veggies before hand? That would be a bonus! It depends on the veggies. When I make them with mushrooms, spinach, tomatoes, or peppers I don’t cook them before. Hope this helps! How big is your muffin pan. 7 eggs only filled up 5 of my muffin holes! I just made another eggwash Bach and continued so we will see if they come out good?? Hi, I really don’t know but you can check here: http://www.acaloriecounter.com Hope this helps! Hi i was wondering if these could be kept refridgerated for a few days after making them or frozen? Hi, you can keep them in the refrigerator for 2-3 days. They also freeze well. Hope you enjoy them ???? Single mom of two and trying to find easy meal prep ideas. Would these be good to freeze? How could i reheat them? Or to keep in fridge for up to 4 days? Ever freeze the breakfast egg muffins? And if so how do you prepare them? They freeze well. You can put them in the oven afterwards. If I batch cooked them how long would they be good for ? These look so yummy,, I bet the kids would love to help make them too. These will be great for busy mornings, thanks for the idea! Thank you! My kids love making these muffins! I am in the process of making these and have to stop and go to the store because seven eggs wasn’t close to enough. I got five and a half muffin cups filled, so it’s off to the store for me. I’m so sorry about this. Maybe the recipe varies a little depending on the size of the eggs. For me 7 large eggs was enough. The eggs will expand a lot in the oven as they cook, so beware of that as you add more eggs. I just made with 10 eggs in regular muffin size pan, as I have 2 high schoolers. They look and smell delicious! Rounded up over the cups as they cooked! Thanks for the great recipe. nice idea but is it light diet ??? Thank you. It is a healthy option. Eggs are very nutritious. thank you so much for this delicious recipe. Glad you liked it. Thank you for your comment and review. Great recipe. Easy. Delicious. Needed more eggs to fill my muffin tins. I have chickens so always looking for ways to use eggs! Used jumbo muffin tins and put a thin round of brown soda bread on the bottom. Trying to give them a base but I don’t really think they need it. 11 eggs for 6 jumbo muffins. Used cubed roasted pumpkin, spinach and cherry tomatoes. Yumm! !